1903 - Standard Wheel Company, Terre Haute, Indiana, expanded its bicycle operation to include the Overland Automotive Division to manufacture motor vehicles. The Overland "Runabout" was introduced. 1908 - John North Willys purchased the Overland Automotive Company, Indianapolis, Indiana. The Pope-Toledo automobile manufacturing plant was purchased and all automotive operations were moved to Toledo, Ohio. 1912 - Willys-Overland Company was formed, producing the famous Willys-Knight series of vehicles and later the "Whippet." 1936 - Willys-Overland Motors, Inc. was formed as a result of a Depression-era bankruptcy reorganization. April 1953 - Willys-Overland Motors, Inc. (facilities, plants, and other physical assets) was purchased by Henry J. Kaiser interests, and Willys Motors, Inc. was formed. March 1963 - Willys Motors, Inc. name was changed to Kaiser-Jeep Corporation. 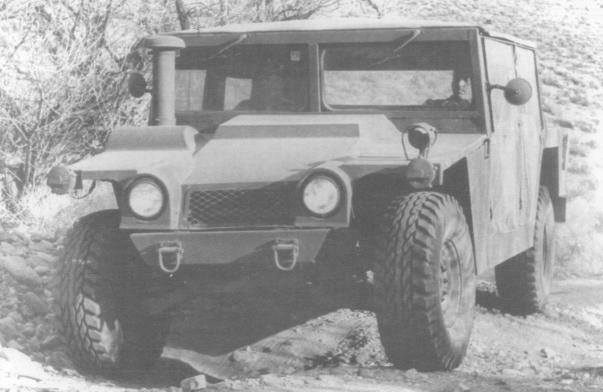 March 3, 1964 - As the Studebaker Corporation of South Bend, Indiana went out of business, Kaiser-Jeep entered into a novation agreement with Studebaker to assume a contract for the manufacture of military trucks. The Chippewa Avenue Studebaker Plant was purchased. February 5, 1970 - Kaiser-Jeep Corporation was purchased by American Motors Corporation. March 26, 1970 - Kaiser-Jeep Corporation name was changed to Jeep Corporation. Jeep Corporation operated a Commercial Products Division with facilities at Toledo, Ohio, and a General Products Division with facilities at South Bend, Mishawaka, and Indianapolis, Indiana. May 14, 1970 - Jeep Comporation General Products Division corporate offices were moved from Toledo, Ohio to Wayne, Michigan. March 31, 1971 - Jeep Corporation General Products Division facilities and business were spun off and a separate wholly-owned subsidiary of American Motors was formed and named AM General Corporation. February 23, 1979 - AM General Corporation corporate offices were moved from Wayne to Detroit (American Motors AMTEK Building). September 20, 1983 - AM General Corporation was sold by American Motors to the LTV Corporation, becoming a subsidiary of LTV Aerospace and Defense Company and doing business as LTV Aerospace & Defense Company, AM General Division. August 20, 1984 - AM General Divison corporate offices were moved from the American Motors AMTEK Building to new facilities off Plymouth Road in Livonia, Michigan. October 1, 1986 - AM General corporate offices were moved to the existing manufacturing facility on Chippewa Avenue in South Bend, Indiana, with the Engineering facility remaining in Livonia, Michigan. November 1, 1986 - AM General working name was changed to LTV Missiles & Electronics Group, AM General Division, as a result of a reorganization of LTV Corporation. February 1, 1990 - AM General working name was changed to LTV Aerospace and Defense Company, AM General Corporation, as a result of a reorganization of LTV Corporation. February 9, 1990 - AM General corporate offices were moved to a new, leased building on Niles Avenue in downtown South Bend as a result of the closure of the Chippewa Avenue manufacturing facility. April 30, 1992 - AM General Corporation was sold by LTV Corporation to the Renco Group, Inc.
AMG and HMMWV History - Click on "History" in the left frame. There is a History of Hummers on the hummer.com web site but, since they've gone to a Flash (much despised by this webmeister) setup, it is not easy to get to. Click on the link above to go to the hummer.com web site. It will take you to a page called "http://www.hummer.com/flash/flash.html". In the location window, replace the "/flash/flash.html" with "/h1/historyhert/index.asp" and you should get to it.